What Is It? An actiony open-world RPG with a memorable vendetta system. Ghûra the Funny One isn't laughing. I suspect the name's ironic; the hulking orc has never been good at telling jokes, from what I can tell, and it doesn't help that he's now sporting a nasty gash from where I thunked an arrow at his head somewhere in the barrows of Udûn. And now, all on his lonesome, he's tracked me down across the muddy Black Road across untold miles to take revenge. Good timing, too: I'm currently stuck parrying the spear of Lûga Ghûl Lover. One uruk captain is bad enough; in my state, two is a death sentence. "You're going to pay for smashing my face," he screams. At this point, I'm already running, and I suspect he'll mock me for it when we meet again. The great pleasure of playing Shadow of Mordor is that this wasn't a mission; it's an encounter that only occurred based on (poor) choices I'd made in the past. It's an open-world adventure with combat and platforming that owes heavy debts to the best action-adventure games of years past, but it blazes a trail for future games with a vendetta system that weaves endless unscripted narratives across Sauron's front door. It plays a key role in generating side missions as the balance of power shifts, and it's just as strong as the main story missions dotted throughout Mordor. This is the story of Talion, a Gondorian ranger who's lost his wife and son (and his own life, at that) to a band of marauding orcs. So far, so formulaic. But above this deceptively flimsy foundation stands a tale that should appeal to even the most disgruntled of academic Tolkienists. Talion's misadventures start the night Sauron returns to Mordor—humans have been gentrifying the joint over the years —and his subsequent mysterious resurrection pairs his body with the wraith of a key elf lifted from the pages of Tolkien's Silmarillion. The associated cutscenes of the main story look as though Monolith pulled them from a proper Peter Jackson production, but at times Shadow of Mordor sags when it relies too heavily on nods to the fandom. They're not even subtle. One second someone will bark at Talion to "Fly, you fool," the next he's told that "Not all those who wander are lost." We get it, Monolith. This is clearly Middle-earth, or more accurately, a fraction of it. Shadow of Mordor takes its title a little too literally for a series that's always been associated with travel and the joys of going "there and back again." I'd come to Shadow of Mordor hoping for views of Moria or Rohan; instead, I got bleak, barren Mordor and, well, slightly greener and wetter Mordor. The narrow focus is a small drawback of the two massive maps that make up the open world surrounding Talion, where he activates missions scattered around his old patrol grounds as he chooses. It's a varied world that's fun to explore, filled as it is with ramshackle uruk forts and the spectral remnants of towers from a lost civilization that serve as both quick-travel points and triggers for nearby missions. It's also the breeding ground for Shadow of Mordor's remarkable ‘Nemesis’ system that creates a world where life seems to go on regardless of whatever Talion's doing. Take Zunn the Brewer. He was the first orc to kill me, back when he was just another nameless face in the green masses I'd jump into. But killing me changed him; it gave him a purpose, a name. More importantly, it promoted him to the rank of captain, giving him spiffy individualized armor, his own abilities, and of course, making it harder to take him down. It's not hard to see the Assassin's Creed in Mordor. Somehow I never got around to killing Zunn. Once we crossed swords again, but he escaped while his buddies and wargs kept me occupied. Later he killed me again—I blame the framerates, more on that later—thus earning him yet another promotion. In time, the oaf became a Warchief, a rank that requires special challenges such as killing 10 enemies by stealth to even spawn Zunn and his bodyguards. It's a great system that punishes death by empowering the the orc who killed you, and it rewards victory through the satisfaction of revenge. And Shadow of Mordor brims with such stories. Consider Ûshbaka the Infernal, a nut who balances a burning cauldron on his noggin, or Ûshgol the Ear Collector, whose necklace proves he takes his hobby seriously. This endless dance of revenge and colorful characters with their own voiced personalities and memories of past encounters creates a story beyond the main narrative that lingers long after the memory Talion's troubles fade away. And that's but the surface of the system. Further nuances lie beneath, such as the way some background orcs chatter about the specifics of your past failures or victories or how you can use your wraith buddy's powers to rip information about the weaknesses and abilities of a captain or warchief from another orc’s brain. If you've failed so much you're seeing multiple captains travel together, you can hop into side missions that let you interrupt duels or hunts and thus kill up to two nemeses. A typical fight sees me zipping across towers and walls, stealth-killing archers and poisoning the uruk's grog. I'm doing well; I've built up a hit streak that lets me execute an orc in the thick of battle. It's one of the many skills I've unlocked by unlocking skill tiers from killing so many captains; still another lets me stun orcs when I vault over them by pressing spacebar. But that's just half of it. Talion, of course, shares his own body with Mr. Ancient Elf, and it's the latter who actually lobs arrows while in a state akin to Batman: Arkham Asylum's Detective Vision. It transforms him into a battlemage of sorts. I press R after building a hit steak, and Talion slams his fist down, sending orcs around him reeling back from the shockwave. I press Z with the bow in action, and he zips toward an enemy as though teleporting. Late in to the game, he even learns the ability to "brand" orcs into serving him, essentially turning them into mind-slaves. It's a shaky moral shift that even Talion expresses discomfort with soon after learning, and it's a fitting homage to the theme of corruption that runs through Tolkien's works. I do regret that Talion never doffs his tattered, homey ranger's cloak. Switching out to flashier digs is one of the things I love most about the Assassin's Creed series, where, for instance, I can make Edward Kenway look more like a proper pirate. Not so here; not without preorder bonuses or DLC. But Shadow of Mordor makes up for some of that loss with a rune system for Talion's sword, bow, and dagger that replaces traditional loot. As they drop from the captains and warchiefs, they yield a compelling reason to hunt them down if you're not so big on revenge. One rune might ignite enemies when you counter with your sword; another might make you immune to poisons. 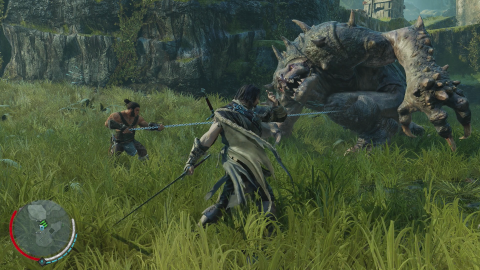 You can even break them down for attribute points, which will allow you to unlock more rune slots for a particular weapon and pump up Talion's health. But tell us how the thing runs, right? Fact is, my own rig's a good deal humbler than the Large Pixel Collider in the PC Gamer office; I simply walked into Mordor with an AMD 2.80 GHz processor, 16GB of RAM, and an NVIDIA GeForce GTX 750 Ti on Windows 7. If the Large Pixel Collider is Gandalf, I guess mine is Meriadoc Brandybuck. Somehow I played the entire game on Ultra settings, chiefly for the sake of the screenshots around these words, although there's no difference between that and the High settings unless you download the Ultra HD texture pack that was just released. I wouldn't recommend it if you're in my situation, but oddly enough, most of the time my PC actually fared well despite running hot. However, my framerates would plummet to slideshow rates when Talion was in cramped villages, surrounded by dozens of orcs, and bombarded with many explosions. These moments aren't that common, and I found the occasional stutter worth it since Shadow of Mordor approaches Witcher 2 levels of beauty when pumped up on graphical adrenaline. I'd hope that Mordor surpasses it with the texture pack installed, but at the time of writing, I don't know. Considering the demands the High setting put on my system, the Ultra texture pack must be a beast, indeed. But Shadow of Mordor still looks stunning on lower settings, and even if you can't experience the glory that is Ultra, you shouldn't miss out on what's undeniably the best Lord of the Rings-based game to date. Oh, and there's a dwarf (though beardless). As a member of the Fellowship of the Beard, that always counts for something in my book.